Driving a refrigerated truck (reefer) is one of the most fundamental jobs there is: bringing fresh food from the farm (distributors) to the people (stores). Reefers are the reason why people from Maine can have ripe avocados, people from Utah can have fresh lobster, and a small milk farmer can be distributed to a large chain of grocery stores. Reefers keep food fresh and safe as it makes its way across town or across the country. There are both pros and cons with most things in life, and driving a reefer is no different. Many truck drivers who want to make themselves more versatile and marketable will get the training and expertise to drive different types of loads that require more knowledge. Whether it’s hazardous materials or special equipment like a dump truck, having these added skills can put a driver above the rest of the pack. Because refrigerated cargo is perishable and must be kept at a consistent, specific temperature, extra training is needed. If temperature requirements are not strictly followed, the cargo is at risk of being spoiled and therefore a total loss, or worse, the cargo could become a public health hazard. Some dry loads are able to be hauled in the reefer which doubles possibilities for filling deadhead loads. Typically, reefer drivers earn more money. 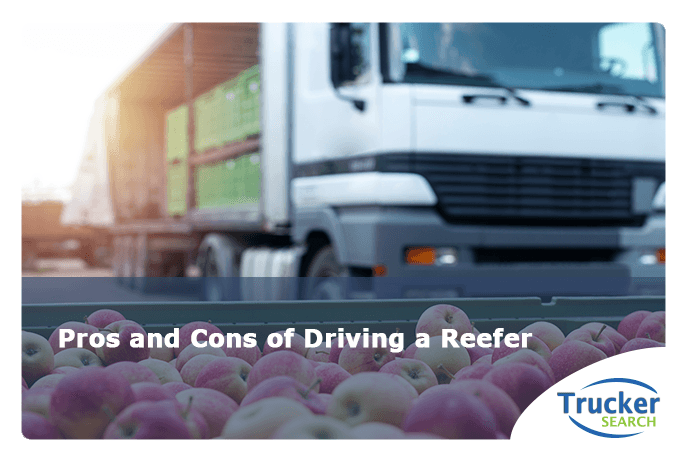 Fresh food is always in demand so there’s a consistent demand for reefer drivers, no matter how well the economy is doing. Long haul drives are common which usually means more money. Lumpers or people who unload trucks often will unload your cargo for you. If you do have to unload your cargo, a cool, refrigerated trailer is nicer than tractor trailers that are sweltering in the summer heat. Most grocery stores and grocery chains have dedicated loading docks so they’re usually easy to maneuver into. Reefers often need to be early-morning deliveries so there can be a lot of night driving. The continuous noise from the refrigeration system can be difficult to tolerate for the driver as well as any trucks they park near. The refrigeration units have to run constantly, including at night. Reefers need to be cleaned out well after each haul. Because there are two tanks and the refrigeration unit runs constantly, they use more fuel. Long hauls are common so driving a reefer may not be the best option for drivers with families or who are looking for more regular hours. Reefer drivers are responsible for controlling the cooling equipment. Breakdowns could lead to freight spoilage. Reefer repairs are more expensive than other vehicles. Driving a reefer isn’t for everyone. Due to the importance of protecting the freight by strictly controlling the temperature and keeping the trailer interior washed and clean, there is more work that goes along with higher pay. However, the added responsibility is the reason why many drivers choose to drive a reefer. Add to that less competition for jobs and work stability even in the worst of economic times, driving a reefer can be a rewarding and lucrative challenge. No matter what kind of truck you drive, Trucker Search can help you find trucking companies that are looking for you. Go to TruckerSearch.com today and post your resume or search the extensive database of companies who need drivers like you. In today’s job market, the decision to earn a CDL (Commercial Driver’s License) is almost a no-brainer. Every day, the need to ship goods all around the country grows and qualified truck drivers are in increasingly high demand. To keep up with the demand for truckers, trucking companies are offering more and more incentives to attract drivers like higher pay, sign-on and other bonuses, and shorter routes for more regular schedules. These opportunities can be yours if you earn your CDL. But how do you pay for the training? Depending on the school and region that you get your CDL, it generally will cost anywhere from $3,000-$7,000. Other factors that can affect the cost are how much time is spent in the classroom and on the road, the reputation of the school and whether or not the class includes board for the duration of the class for students who need it. 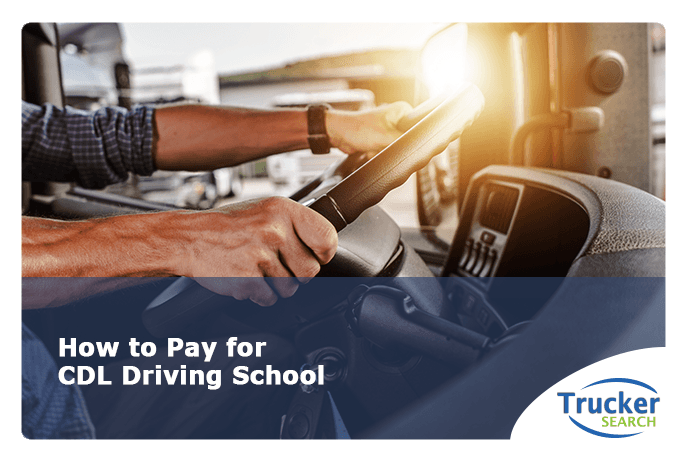 If you don’t have thousands of dollars to pay for your schooling up front or don’t want to spend years pinching your pennies to save for it, there are several options available that’ll help you make your dream of driving a truck a reality. Many schools offer financial aid to help pay for a CDL for those who qualify. They may offer private grants, federal grants, scholarships, and if you are a veteran who is eligible for the GI Bill, you can use those funds for your training. Some schools allow you to finance through them, but get all of the facts before you sign. Their interest rates may be extremely high compared to your local credit union. If you have good credit and have something of value for collateral, you may be able to take out a loan from a bank or credit union. If you do this, be sure to shop around for the best rate. However, taking out a loan can be extremely risky. What if you’re halfway through your training and you realize that becoming a truck driver isn’t for you? Now you’re left with a loan to pay back and if you can’t, you risk your good credit and losing your home, car, or whatever you used for collateral. There are schools that offer less expensive, speed courses to get your CDL. Sure, this can save money but quickie CDL training is less desirable to employers who want to hire drivers who know what they’re doing. If you’re taking a two-week course, you’re not going to get the same thorough training that you would in a more comprehensive course. It also means you’re not getting much driving time. It’s important for your own safety as well as the safety of others, that you get extensive training before you hit the open road on your first job. Trucking companies don’t want truckers who speed through a short course; they want drivers who have taken the time to learn. Training from a good, comprehensive training program will help land you a better job and be a better driver. Paid CDL training is company-sponsored CDL training. These schools are usually owned and operated by trucking companies who will pay for your schooling as long as you agree to work for them for a period after you’ve been certified, usually 6 months to a year. Some may require you to pay them back during the contract period in which you’re working for them or some may have you pay up front and they’ll reimburse you upon completion. Companies who do tuition reimbursement may not pay you a lump sum when you’re done. Instead, they may pay you $100-200 a month until it’s paid off which can take a long time. If you don’t want to be locked into a contract, pay upfront and be reimbursed after you’ve earned your CDL. You could possibly lose your reimbursement but have no obligation to work for the company if you change your mind. However, getting locked into a contract with a trucking company shouldn’t automatically be a bad thing. When you earn your certification, you’ll be a rookie. Any company who hires you is taking a chance that you’ll be a safe and productive driver for them. It’s a good idea to stick around for the first year and not only learn the ropes but to show potential employers that you have longevity. Paid CDL can be a great option. The company is investing in you, and they want their drivers to be able to do the job well and to drive safely so they’ll take the time to train you properly. If they’re not doing that, they’ll lose money on their investment. The company will also be training you on the equipment you’ll be be driving and teach you their own procedures which will make your first day on the job go much more smoothly. Do plenty of research to determine if driving a big rig is for you. While it’s difficult to be certain until you get behind the wheel and on the road, if you can look closely at all of the angles ahead of time, you might save yourself some money. There’s ample information online about the ups and downs of life as a truck driver. If you know someone who drives a truck, ask if you can ride along for a day and get a feel for what it’s like. Driving a truck is not an easy job but it can be rewarding and lucrative. Before you decide which route to take, research the trucking companies in your area with a good reputation and that you plan on applying at when you graduate. Do they have their own trucking school? If you choose their school and they pay for your CDL, you’ll be hired when you’ve successfully completed the course. If you choose to pay for it yourself, check out several schools thoroughly before you commit to one. They’re not all the same and you should choose your school by what you’ll get out of it―not merely your CDL but the individual attention and ample classroom and driving time they have to offer. Classroom time is important too but driving a big rig is something that requires hands-on learning. Earning your CDL can be the first step to a long and successful career in the trucking industry. Whether you want to join a large trucking company or you aspire to be your own boss as an owner/operator, it all begins with your CDL training. With all of the incentives and aids to help drivers afford training, your rewarding career in trucking can be just around the corner. If you’ve earned your CDL and you’re looking for that first great job, look no further than Trucker Search. Trucker Search gives truckers a place to post their resumes where they can be seen by thousands of potential employers, as well as search the database of hiring companies themselves. It’s a fantastic resource for truckers who are just starting out or seasoned drivers looking to find a new job. Start your search today at TruckerSearch.com. Because of their potential danger, hazardous materials need to be handled differently than other materials. Besides proper handling procedures, drivers need to be trained on what to do if there’s an accidental spill. Having a HazMat certification makes drivers more marketable. Trucking companies look for truckers who have obtained their HazMat certification because they want drivers who can drive any load, even if they rarely handle hazardous materials. Typically, drivers with their HazMat certification find jobs quicker and earn higher pay because they are in higher demand and there’s less competition. These requirements vary from state to state and individual state requirements can be found here. 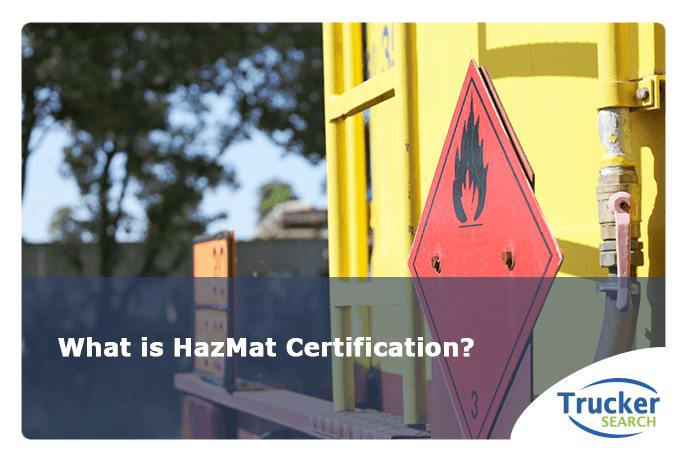 The HazMat test covers Federal and State HazMat regulations, how the various materials are transported, and the proper way to safely load and unload them. Failing to pass the HazMat test or meeting the aforementioned endorsement requirements has no effect on a driver’s CDL. The TSA will notify applicants whether or not they have been cleared after they receive all the information they need for a criminal background test. A failure can be appealed as long as it is done within 60 days. Obtaining a HazMat Certification is a great way for drivers to expand their knowledge and open more doors. Specialized truckers who can handle any job are always in high demand. For drivers with a HazMat Certification, Trucker Search can be a useful tool in finding hiring companies looking for HazMat drivers. It has searchable jobs so truckers can see exactly what hiring companies are looking for and it allows truckers to post a resume that includes all qualifications along with any added endorsements. It’s a web-based service that’s quick and easy to use and a vital tool for truckers in search of great companies to work for. Start your search today at TruckerSearch.com. Whether driving a tractor-trailer truck or your own passenger vehicle, there are some people who enjoy the complete control they get by driving a manual transmission vehicle while others prefer the ease and simplicity of an automatic. In the personal vehicle market, fewer and fewer people are opting for manual transmission vehicles, in fact, you might be hard-pressed to walk onto a lot and find one. In the trucking industry, manual transmissions have always been the standard. With as many as 18 gears to shift down, tractor-trailer trucks can be tricky to learn, especially for those who are inexperienced with driving a manual transmission vehicle. 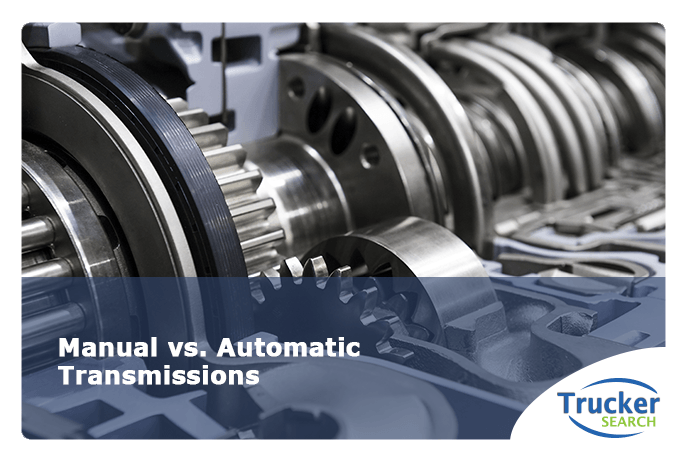 Recent trends have shown an increase in automatic transmissions coming off the assembly lines and hitting the roads, but which is better? Manual transmission trucks are, of course, ones that the driver manually shifts the gears. Automatic trucks come in either fully automatic like an automatic car, or Automated Manual Transmissions or AMTs that have a gearbox shifted by a computer. For many, preference comes down to control. Being in control of when to shift up or down gives the driver more control over the truck. One of the biggest complaints about Automated Manual Transmissions is that they accelerate too slowly. The computer works its way through the gears efficiently as it is programmed to do, a driver would manually shift faster to gain momentum faster. AMTs are simply easier to drive. When a driver doesn’t have to concentrate on shifting, he or she can focus on what’s happening on the road ahead. AMTs are considered to be safer than manuals that take greater focus. In heavy traffic, Manual Transmissions can be downright tedious. Not having to constantly shift gears as you creep along can make dealing with stressful traffic a little easier. Shifting through all the gears can be tiring as well, although many drivers feel the opposite is true. 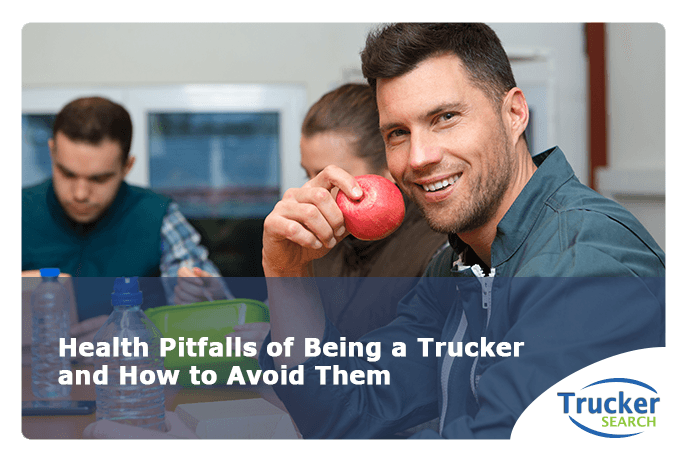 Some people feel that driving an AMT is too relaxing and being too relaxed when driving a big rig can lead to drowsy driving and falling asleep behind the wheel. 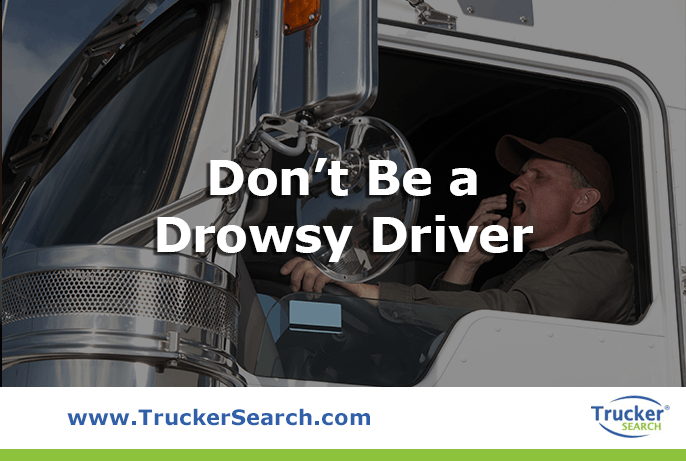 Drowsy driving is a huge problem for truckers who spend hours on end driving the country’s highways and is a leading cause of highway accidents. Experienced truckers are generally good about driving to save fuel. If they’re owner/operators, fuel costs are one of their biggest expenses and for truckers who work for trucking companies, there are bonuses for adhering to the company’s fuel economy standards. When the computer is doing the shifting, gas mileage is maximized and the savings can be considerable, especially when the drivers are less experienced. The U.S. is currently experiencing a severe truck driver shortage that is having an impact on shipping costs nationwide. For this reason, truck companies are looking to Automated Manual Transmissions or Automatics as a way to bring in more drivers. As the number of manual transmissions in cars diminishes, so does the number of young people who have ever driven a manual. Manual transmissions are seen as a hindrance to younger applicants who may find the thought of driving a manual transmission truck intimidating. AMTs are easier to be trained on, and the ease of training also shortens the training period. The current average driving age in the U.S. is 55 with more drivers retiring than coming in to take their places. AMTs and Automatics allow older drivers to drive longer. When arthritis might stop a driver from being able to shift as they once did, an AMT makes it possible for them to put off retirement, which is a huge help to the industry. Although lovers of Manual Transmissions may not like it, Automated Manual Transmissions are the direction the industry is headed due to their ability to save money through fuel economy, driver recruitment, driver retention, and safety. Whether you drive a manual or automatic, Trucker Search provides a way for truckers to find a great company to work for or for shippers to find great truckers to join their team. Go to Trucker Search and begin your search today. Driving a truck is one of the most dangerous jobs you can have. 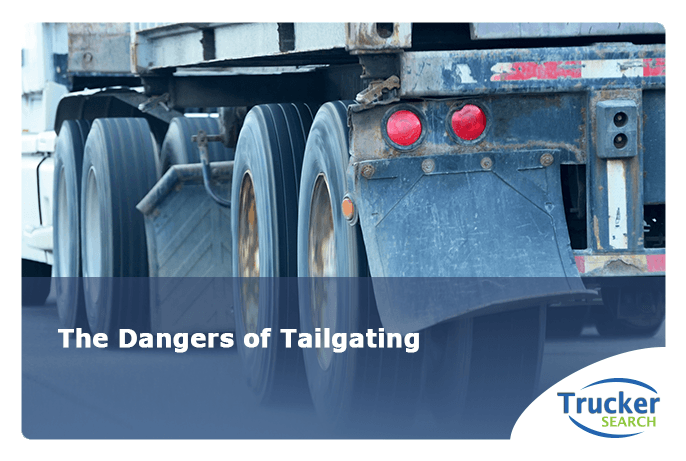 With more and more distracted, impaired, or drowsy drivers on the road, it’s really no wonder that crashes involving large trucks have been on the rise in recent years. In 2016, the number of large trucks involved in fatal crashes rose to 4,213 from 4,074 in 2015, an increase of 3%. 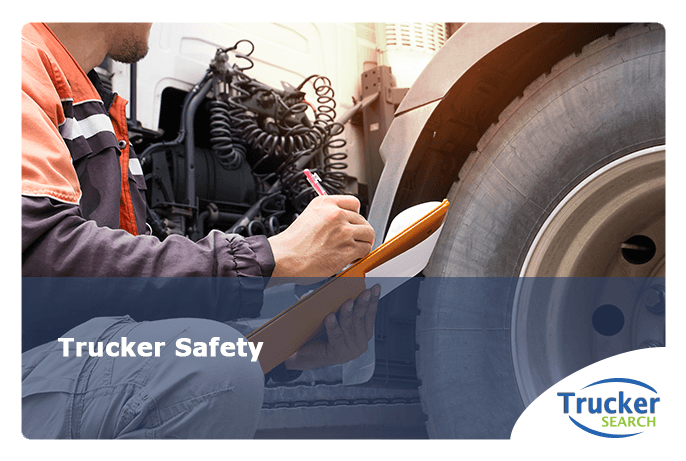 When truckers aren’t driving, they face potential dangers while parked and sleeping during long-distance hauls, and even if all goes smoothly, there are potential scams that target the trucking industry that they need to be alert to. Whether on the road, at a truck stop, or in the work process, truck drivers need to always be aware of potential dangers. Overnight parking is a necessity for long-haul truckers. There are Hours of Service regulations to prevent truckers from working too many consecutive hours risking falling asleep behind the wheel. Finding a safe place to rest is essential. Look for a well-lit area to park. Look for a place that is open 24-hours-a-day. Park near other drivers. You’ll be less of a target for thieves if other people are nearby. Carry protection. Make sure that whatever you choose, you know the proper way to use it! Look for a parking space that is easy to leave in a hurry. Pull-through parking spaces allow you to leave an area quickly if needed. Always lock your truck when you leave it and when you’re in it. Be confident. If you carry yourself with confidence, criminals and scammers may leave you alone. Look around when getting in and out of your vehicle. Keep your cell phone with you and charged at all times. The reason for being a safe driver isn’t just about avoiding injuring yourself or others, it’s also essential to do your job well and make deliveries on time. Don’t change lanes more than you have to. Follow the Hours of Service restrictions. If you’re feeling drowsy, stop to stretch, take a cat nap or have a cup of coffee. Don’t ignore drowsiness or use drugs to keep you awake. Give others space. Assume that everyone else is a terrible driver who may cut you off. Keep your truck maintained to avoid breakdowns and accidents. Drive for the weather conditions. Even though you have a deadline, you must adjust your driving for bad weather or risk not getting to your destination at all. Larger companies are generally well-regulated and you don’t really have to worry about them scamming you. While most smaller companies are reputable and try to build a successful business, there are disreputable ones that will do things that risk the safety of their drivers. Things like requiring them to drive more hours than are allowed, using vehicles that are not able to pass inspections, lack of appropriate insurance to protect their drivers and loads, or exceeding the weight restrictions on loads. These companies will often hire drivers as independent contractors rather than take them on as full-time employees in an attempt to bypass regulations by OSHA, the IRS, and the DOT. Someone with info on one of your trucks claiming to be a repair shop in need of payment for a non-existent repair. Someone who has gained info on one of your drivers claiming to be the driver who has broken down and is in need of money to be wired for repairs or a tow. Someone claiming to be a tow truck driver needing payment for a tow that was never done. Truckers should also be alert to anyone pretending to be a police officer or DOT official. These scammers state some kind of violation and demand immediate payment. Always check credentials and if there’s a violation, tell them your employer will take care of it. Never give out any banking information or MoneyCodes. A career in the trucking industry can be a rewarding and lucrative one. However, it’s important to always be on the lookout for unsafe conditions, potential dangers, and fraud. Trucker Search, a leading trucker job search website, yields detailed information on companies looking for drivers. Truckers can make an informed decision and it’s a great resource for finding a great company to work for. Go to Trucker Search today to see all it has to offer. People throughout the world are becoming more conscious of the impact they make on the planet. From recycling to composting to using reusable bags at grocery stores, people are taking steps to reduce their carbon footprints and create a greener planet for future generations. Let’s face it, trucking is a highly pollutive industry. Medium and heavy-duty trucks alone account for 23% of all greenhouse gases according to the EPA. With the popularity of Amazon and other online retailers going through the roof, the number of trucks on the road and pollution will continue to rise and unless the trucking industry takes steps to mitigate greenhouse emissions. With changes in climate looming in the not-too-distant future, it’s now more important than ever that people take steps, no matter how small, to lessen their impact on the environment. Sure, going green is good for the environment and its inhabitants but it can have a positive impact on your wallet as well. The main pollutant for truckers is CO2 emitted by their trucks. Cutting down on emissions means cutting down on fuel consumption which can save a significant amount of money. As a trucker, you have the ability to greatly reduce your negative impact on the environment and save money to boot. Use GPS or software to plan your route in advance. Avoid heavy traffic or areas with lots of stop signs or lights, if possible. Within your plan, include stops for gas and food. Avoid idling whenever possible. Idling is so harmful to the environment that California passed a law restricting idling. Other states may follow suit as they look for ways to cut down on greenhouse gases. Maintain your truck. One effective way to cut down on fuel consumption is to properly maintain your truck. Aside from helping to avoid costly breakdowns and prolonging your truck’s longevity, getting regular oil changes, frequently changing air filters, replacing misfiring spark plugs, and maintaining the right tire pressure can greatly improve fuel efficiency. Use an ELD (Electronic Logging Device). Using one to log your hours will eliminate the need to log them on paper. Besides, using an ELD was passed into law in 2016 as a way to combat fatigue among trucker drivers. If you’re not using one, you’re out of compliance. Fill up in the morning. Temperatures are lower in the morning and because fuel expands as it becomes warmer, you’ll be able to squeeze more fuel in your tank and won’t have to fill up as often. Don’t speed. You may feel the pressure to get your load to its destination as fast as possible, but speeding can really eat into fuel consumption. Remember, on highways the magic number is 65. Driving between 60-65 MPH instead of 75 can improve a truck’s MPG by up to 27%. Lower your A/C. When you use your A/C, fuel consumption is increased by 0.2-0.4 miles per gallon. Of course, you won’t be able to stop using your A/C altogether but cutting down when you can will make a big difference. Recycle your tires. Truckers go through an abundance of tires. Find out where to take them at Earth911. Recycle everything else too. Life on the road involves significant waste. Plastic bottles, aluminum cans, and clean paper should all be kept in a separate bag to be recycled. Many truck stops and gas stations have recycling bins, but if you can’t find one, go to Earth911. Think reusable. You can cut down on all of that plastic waste by bringing snacks, drinks, and meals from home. Bonus: the foods we pack from home usually are healthier and have fewer calories than the food we buy on the road. It’s usually cheaper too. 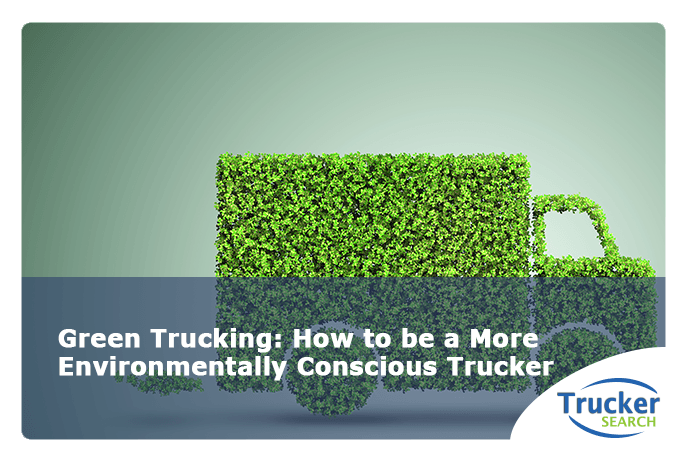 By becoming a more “green” trucker you make yourself potentially attractive to employers, and in fact, it can open up a growing sector of companies who are making efforts to go green themselves. Why would a company spend time, energy, and money reducing its carbon footprint and not ship its product in the greenest way possible? When it comes down to it, going green means saving fuel which is important for shipper and trucker alike. 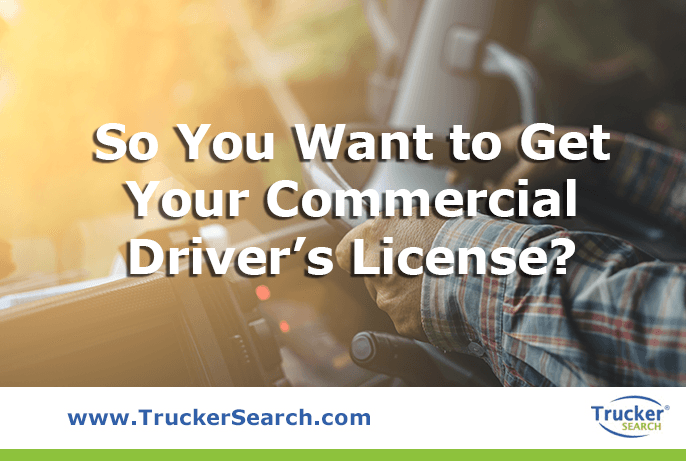 If you’re a trucker looking for companies in need of drivers, whether you’re an owner/operator or you’re looking to work for a shipper with its own fleet, Trucker Search can help. With our vast database of job listings, you’re sure to find the right job for you. You may also post your resume online and let the shippers look for you. Choose what state or region you’re looking for and Trucker Search will do the rest. Go to Trucker Search and find that new trucking job today! So You Want to Get Your Commercial Driver’s License? Are you a recent high school graduate and you’re not going to college but you want to earn a good salary? Maybe you’re tired of your low-paying, dead-end job and are looking for a career change. Or maybe, a career as a truck driver has always been appealing to you. Now what do you do? Obviously, if you want to be a truck driver, you need to know how to drive a truck. You need to obtain your CDL―Commercial Driver’s License―which comes in Class A, B, and C, each allowing you to operate different kinds of vehicles. While you can drive tractor trailer trucks with either a Class A or B license, the weight of the tractor cannot exceed 26,001 lbs. and the trailer must be less than 10,000 lbs. For this reason, there will be more job opportunities without the weight restrictions, if you’re interested in driving tractor trailer trucks. CDL training courses vary from 1-12 weeks depending on whether you take full-time, 5-days a week classes or part-time and which license class you’re want to obtain. Class A courses generally take the longest because the license allows you to drive a greater number of vehicles. You took the CDL course and passed with flying colors. Now it’s time to get your CDL permit. All of the rules and regulations for your CDL are mandated by The Federal Motor Carrier Safety Administration (FMCSA). Although states may have their own requirements, they still have to adhere to federal rules. To be eligible to apply for your CDL, you must be 21 years old to drive across state lines as well as operate a vehicle carrying hazardous materials. If you have felonies on your record, you may be disqualified for CDL eligibility. When applying for the permit, you must supply your current driver’s license, a 10-year driving history (the DMV may check this or you may be asked to bring a copy), and a Medical Examination Self-Certification Form. This form certifies a qualifying medical examiner stated you are physically able to drive a commercial vehicle. Provide a vehicle for your skills test. It must be the same type that you’re planning to test with and drive after you’ve gotten your CDL. It’s important to note that each state may have different requirements in each of these steps. For example, some states require that you complete a CDL course where other states do not. A list of rules and requirements by state can be found on the Department of Motor Vehicles’ website here. There may also be additional testing and forms needed to add an endorsement to your CDL (A, B, C). You did it! You earned your CDL and you’re ready to hit the open road. Now what? You need to find a place where you can search for jobs or post your resume for hiring companies to see. Trucker Search is that place! At Trucker Search, you can find a great job to begin your trucking career. With our easy-to-use interface you can get your resume online in minutes and it will be viewed by companies all over the country looking for drivers. You can also actively search our nationwide database of companies searching for drivers like you. Go to TruckerSearch.com or call (888)254-3712 to find out more! For truckers, getting enough sleep isn’t just a health issue, it’s a safety issue. According to an AAA Foundation for Traffic Safety Analysis, 7% of all crashes and 16.5% of all fatal crashes involve drowsy driving. Driving after 20 hours without sleep is the equivalent of a DUI as if you had a blood-alcohol count of 0.08% which is the legal limit. Falling asleep behind the wheel is a real danger for truckers and the solution for fatigue isn’t as simple as drinking some coffee. Sure, a bit of caffeine might wake you up but the effects are short-lived. When you have caffeine and are in need of sleep, you may actually experience “microsleeps” which is when you actually fall asleep for 3 or 4 seconds. If you think nodding off for a few seconds isn’t a big deal, the next time you’re driving on the highway, take note of the great distance your vehicle travels in 4 seconds when traveling at 55MPH. It’s easily enough time to cause a serious accident. The FMCSA (Federal Motor Carrier Safety Administration) sets driving limits for truckers in order to avoid accidents due to fatigue. The limits are on hours you can drive after the required number of off duty hours and how many hours you can drive per week. They can be found at the FMCSA’s website here. Even following the guidelines, it’s easy to become drowsy while driving. There’s much talk about driverless trucks and their potential to take over the trucking industry but the technologies they’ve brought about can be used today to make driving a truck safer for current drivers. Things like blind spot detection, automatic emergency braking, and lane departure warnings are technologies that could solve or lessen the problem of driver inattention. Without those, protecting yourself against drowsiness is the first line of defense. Getting a good night’s sleep is the best place to start. For many drivers, sleeping on the road can be difficult. Everything is different than the comforts of your own bed and things like lights, sounds, smells, or movement and vibrations that are foreign to you can keep you awake. Eating unhealthy foods on the road can also inhibit sleep. Sunshades, curtains, or blankets can be used to block any light that might interfere with sleep. Reading a book before bed or listening to calming music can help relax you but you should avoid screen time. Earplugs are a great way to block out the noises of a busy truck stop. If you have to get up in the middle of the night, it’s helpful to keep things as dark as possible. Parking away from other vehicles when you plan on sleeping can help reduce noise. If you turn down the volume on any electronic devices you may have, you won’t be awakened by alarms or notifications during the night. A white noise machine is helpful in blocking out background sounds by emitting a consistent sound. Fresh air is great for sleeping and by using window screens, you can let the fresh air in and keep the bugs out. Smells can wake you up too so you should try to avoid parking next to dumpsters, portable toilets, or anything smelly. Sleeping when it’s dark helps your body’s internal clock working properly. Sleep apnea can keep you from getting a restful sleep. If you suffer from it, you should see your doctor for help. Natural sleep aids are a preferable choice to pharmaceutical ones. If you park where you shouldn’t, someone could wake you in the middle of the night to ask you to move. If you’re drowsy during the day, try a 15-minute power nap might be enough to re-energize you. Exercise is beneficial to sleep but if your workout is close to bedtime, it’s important to leave a little time to cool down and relax. Resting your body is an important part of your job as a trucker. Driving for hours can take a physical and mental toll on your body but by keeping in shape and giving your mind and body the rest that it needs, you’ll be better equipped to do your job safely.